Bob Dornan’s Newly Released “Yearly Devotional” is an Insightful Compilation of Abridged Sermons He has Preached through Over Twenty Years of Ministry. 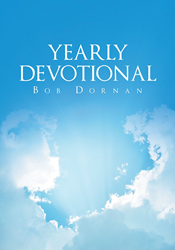 “Yearly Devotional” from Christian Faith Publishing author Bob Dornan is an engaging book that contains abridged sermons regarding various subject matters in a person’s everyday life as well as life experiences related to stories from the Bible. “Yearly Devotional”: a revelatory book that provides readers with biblical insights upon delving into topics related to everyday living. “Yearly Devotional” is the creation of published author, Bob Dornan, a pastor who mixes humor and history with life experiences from careers in social work, the military, and pastoring that makes for interesting, entertaining yet thought-provoking reading. Published by Christian Faith Publishing, Bob Dornan’s new book is an enlightening compilation of sermons and personal reflections that intend to share the “good news” often relating it to his life experiences as a small-town boy raised during a time in Western Pennsylvania where love of God and country, respect for leaders, and other exceptional moral values were evident. The author’s love for history and sense of humor have made the book an enjoyable read. His work helps people to apply biblical lessons in their respective Christian walk. View a synopsis of “Yearly Devotional” on YouTube. Consumers can purchase “Yearly Devotional” at traditional brick & mortar bookstores, or online at Amazon.com, Apple iTunes store, or Barnes and Noble. For additional information or inquiries about “Yearly Devotional”, contact the Christian Faith Publishing media department at 866-554-0919.